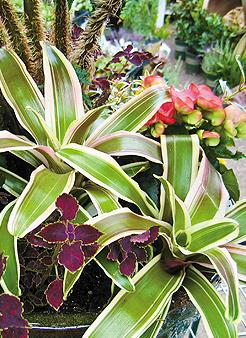 No other type of gardening offers instant gratification in the way a container garden can. It is fun to help guests put winning combinations together at Tangletown Gardens—sending them home with a sure recipe for success, and a guarantee to be the envy of their neighbors. In a matter of a few hours, one can create a complete “garden,” with the boundaries being the vessel in which it is contained. That time includes travel to and from the garden center, planting, and placement, with time left over for admiration of a job well done. My container style is a bit on the bold side, with much emphasis placed on foliage, form, and texture. Flowers become somehow secondary in choosing plants for my combinations. As a horticulturist, I seek out the unusual. Interesting combinations begin with unusual plants. As a designer, it is my job to accentuate the beauty of these plants by the companions and containers I choose for them, and their placement in the landscape. A well-designed container garden is a composition of art, similar to sculpture, where all components work together, while honoring the principles and elements of design. The plants are often a catalyst for putting together an incredible combination. With so many choices available at our fingertips, I cannot help being drawn in by their addictive qualities. I will often be drawn to a particular plant, and choose companion plants that are complementary in form, texture, and color. The plants will tell me what they want to be partnered with—opposites attract—smooth textures next to bold, upright forms with trailing, cool colors with hot, etc. Container choices are also important in this style. For me, the container is the vessel that allows a container garden to exist, and much attention should be placed on how it works within its surroundings. I tend to choose containers that complement the architecture of the home, and yet still are an expression of the homeowner’s personality. Whether contemporary or traditional, I prefer outdoor containers to be more clean-lined versus fussy, allowing the plants to be the stars. Container combinations are often the focal points in my garden, making both their artistic and architectural roles very important. They are a concentrated version of creative energy—a reflection of my creative side and love of plants, while serving as a bridge between house and garden. Scott Endres is co-owner of Tangletown Gardens at on 54th and Nicollet in South Minneapolis.